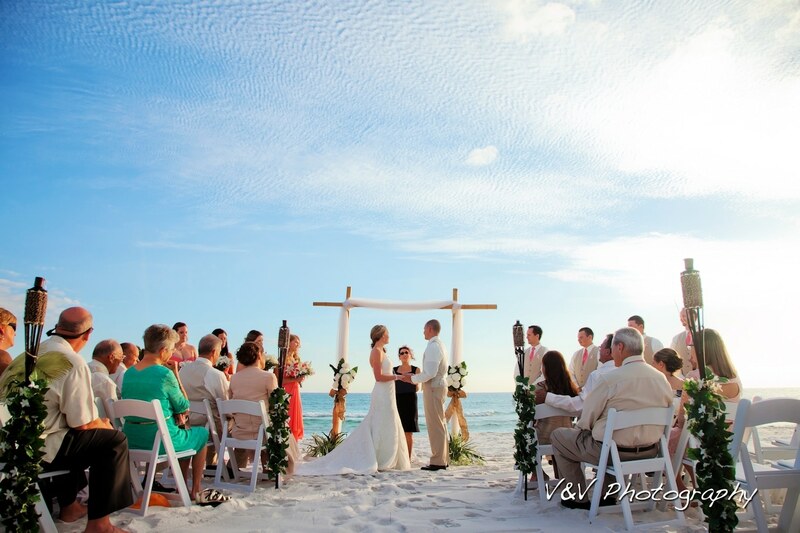 A wedding on the gorgeous, white sand beaches of the Emerald Coast is amazing because it is able to achieve something that is nearly impossible: it allows you to be relaxed, surrounded by lush coastal beauty, on one of the most important, momentous days of your life. 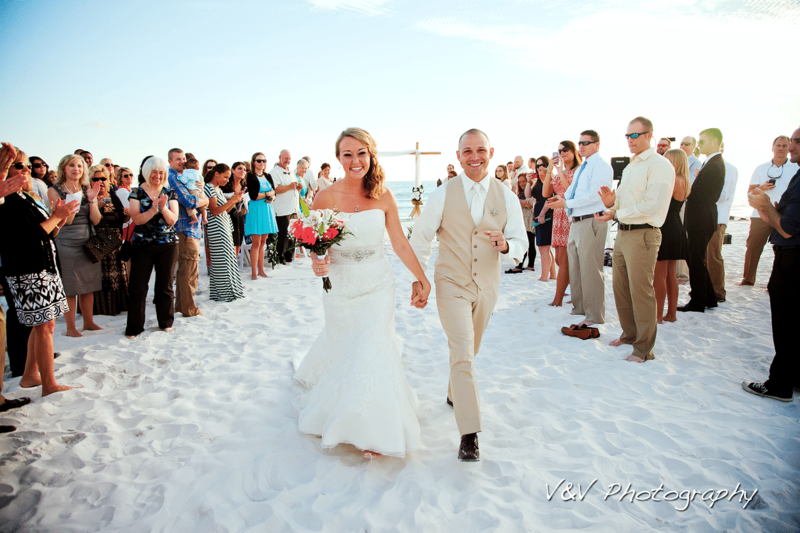 A beach wedding and reception combined with the fantastic imagination of the wedding pros at Celebration Hall allows for so many fun, unique ways so make your nuptials memorable. From seashell bouquets to starfish decor, to exiting your reception on a boat, there are so many fantastic ideas that’ll only work at this idyllic setting. Here are a few of our inspiring ideas to get you started! Bouquet -from colorful orchids against banana leaves, to the addition of starfish and sea shells, beach weddings are perfect for the bride who loves whimsical details. Fill your bouquet with contrasting colors, like orange and blue or incorporate corals or delicate sea fans into it. Be sure to continue the theme into your groom’s boutonnière. Attire -Take a casual approach with a short & simple dress, paired with shorts for the groom. Or go for a more glamorous approach with fabrics that will dazzle in the soft light of a setting sun and move like a dream in the gulf breezes like silk or chiffon. 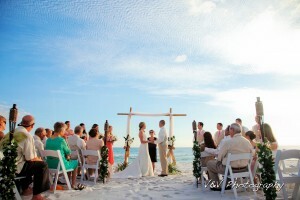 Dreaming of a barefoot ceremony? You can still dress up your feet with anklets made of tiny shells or pearls. And we never met a groom who didn’t like standing barefoot in the sand, instead of cramped dress shoes, as he waits for his bride. Bridesmaids’ Accessories – Bright leis make fun photo props, as are sun glasses and parasols in your wedding colors. Grass skirts are also fun. Decor -Imagine rows of glowing lanterns, tea lights or even tiki torches. The natural beauty of the beaches provides a lavish setting without having to spend a fortune. 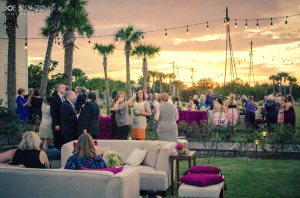 Use surfboards as tables or 3D art, enjoy a fireworks show on the shore or hire professional fire or Polynesian dancers to entertain your guests during cocktail hour. Carry the beach theme over into your wedding cake and table decor. You can use coral to mark table numbers, and fondant can be made to look like a tower of edible sugar shells. The possibilities are endless. 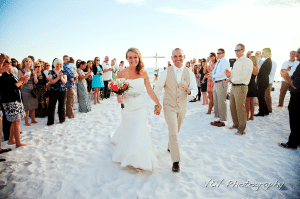 For more fresh ideas for your wedding, stop in to see the professionals at Celebration Hall, located on a beautiful stretch of Scenic Hwy 30-A in Santa Rosa Beach, Florida. Your guests will be in awe when they see our vaulted beamed ceilings, oak doors, and massive wrought iron chandeliers which have been scaled to impress. Bringing to mind the luxury and romance of a historical venue, Celebration Hall was inspired by the grand halls of European manor homes. We can offer a seated capacity around 150 people inside, with many more with the addition of our lighted lawns and patio area. We also have a state of the art sound system and free parking for your guests. 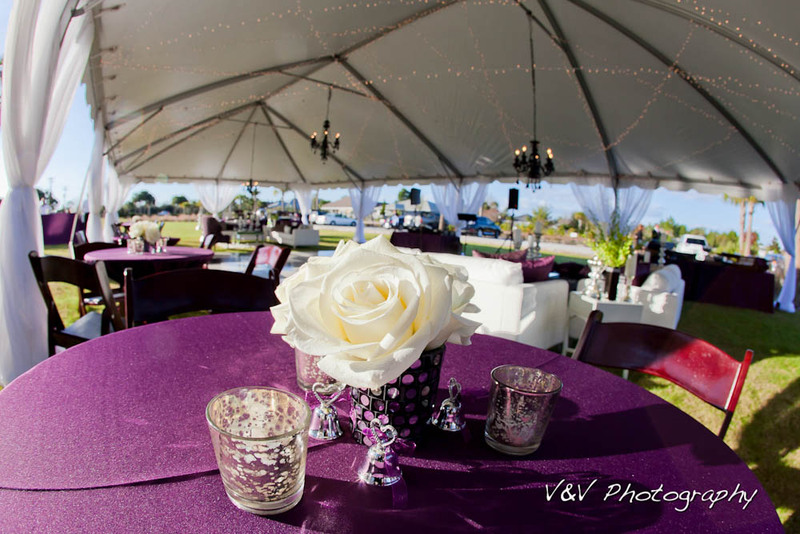 Our professional staff at Celebration Hall will help coordinate all your wedding and event needs, from decor, to lightning, to arranging a cake, to catering and so much more. In fact, to make things easier, we have screened and selected a group of the best area vendors, which includes a varied group offering different styles and price points for every taste. We are located on scenic route 30-A amidst the beautiful beaches of Santa Rosa Beach, Florida. Just steps from Celebration Hall is Suites 30-A, the perfect spot to start a honeymoon or take care of all your guests lodging needs. The best way to reach us is email: thecelebrationhall@gmail.com but feel free to call us as well at: 850-499-2652. We are happy to put a courtesy hold on a date for a limited time, to allow time for you to make your travel plans to visit the property before making a commitment, without obligation. You will be given the right of first refusal for that date. When you have decided to book your event, a non refundable deposit of ½ the venue fee will secure your date. Weddings Are A Huge Deal. This is not breaking news in the least. You are giving your heart and pledging your life to someone. Like all special events in your life, you want yours to be magical and memorable for everybody, especially yourself. This day is about you and you want it to be a dream come true! With that said there are so many options to make your wedding memorable and reflect who you are!